Home From the Marshal Impressive Firearms Auction coming up! Impressive Firearms Auction coming up! On December 6, 7, and 8, 2008, the firearms and estate of Wilbur Henry Hoffeld will be auctioned by the Rock Island Auction Company in Moline, Illinois. The Hoffeld collection is a study in the manufacturing of firearms, and more specifically – Colts. The auction will include over 1,000 Colts, 8 Patersons, 2 Walkers, over 350 Colt Percussions, over 80 Colt Brevetes, over 100 Colt First Generation Single Actions, dozens of 1877’s and 78’s, more than 300 Winchesters, 5 Henry Rifles, Civil War Items, and more. The Rock Island Auction Company has an impressive website and the auction catalog is also available online. If you have money to burn, but cannot attend the auction live, their website gives you the option of bidding as an absentee. Even if you have no interest in bidding, but enjoy firearms history, browsing the catalog is quite interesting. 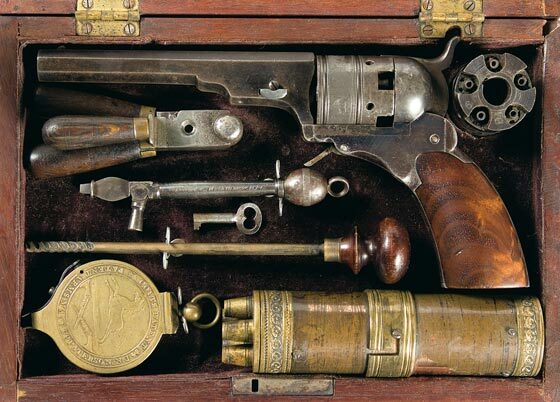 Here’s one of the goodies – a fine Colt Belt Model Paterson Revolver No.2 with Inscribed Factory Case and Accessories. Estimated price: $110,000 – $160,000. For more information, visit www.rockislandauction.com.